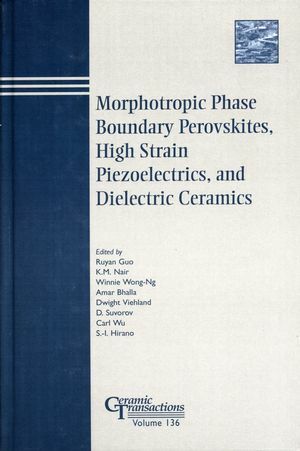 Proceedings of the Symposium on Dielectric Materials and Multilayer Electronic Devices and the Symposium on Morphotropic Phase Boundary Phenomena and Perovskite Materials, held April 28 - May 1, 2002, in St. Louis, Missouri, during the 104th Annual Meeting of the American Ceramic Society, and the Focused Session on High Strain Piezoelectrics, held April 22-25, 2001, in Indianapolis, Indiana, during the 103rd Annual Meeting of the American Ceramic Society. K. M. Nair is the editor of Morphotropic Phase Boundary Perovskites, High Strain Piezoelectrics, and Dielectric Ceramics, published by Wiley. Morphotropic Phase Boundary Material Systems and Their Structure-Property-Chemistry Relations. Local Atomic Structure and Morphotropic Phase Boundary (T. Egami and W. Dmowski). Structure and Dynamics of The Ferroelectric Relaxors Pb(Mg1/3Nb2/3)O3 and Pb(Zn1/3Nb2/3)O3 (Gen Shirane and Peter M. Gehring). Morphotropic Phase Boundary and Related Properties in Relaxor-Based Piezoelectric Perovskite Solid Solutions (Zuo-Guang Ye). The Morphotropic Phase Boundaries in Perovskite Ferroelectric Relator Systems (Edward Alberta, Ruyan Guo, and Amar Bhalla). In-Situ Neutron Diffraction Study of the Ferroelastic Behavior of Pb(Zr,Ti)O3 (R.C. Rogan, Ersan Üstündag, B. Clausen, M.R. Daymond). Fourier Harmonic Analysis of the Electrmechanical Response of Electroactive Materials (Christopher DiAntonio, S.M. Pilgrim, F.A. Williams Jr., W.A. Schulze). High Curie Temperature, High Performance Perovskite Single Crystals in the Pb(Yb1/2Nb1/2)O3-PbTiO3 and BiScO3-PbTiO3 Systems (Shujun Zhang, L. Lebrun, C.A. Randall, T.R. Shrout). Electromechanical Performance Advantages and Limitation of <001>- Oriented Pb(Mg1/3Nb2/3)O3-PbTiO3 Crystals (D. Viehland and Li). Polarization Induced Cracking in Partially Electroded PSZT Ceramic (R.H. Moore, S.N. Burchett, G.R. Burns, S.J. Glass, M.A. Hutchinson, T.W. Scofield, M.E. Stavig, C.S. Watson, P. Yang). Acceptor Doped PZN-PT Single Crystals (Laurent Lebrun, S. Zhang, C.A. Randall, T.R. Shrout, D. Guyomar). Structure and Dielectric Properties in Novel BiGaO3-PbTiO3 Crystalline Solutions (Jinrong Cheng, Wenyi Zhu, Nan Li and L.E. Cross). Preparation and Electrical Properties of Pb(In1/2Nb1/2)O3 Based Relaxor Materials (N. Ichinose, Y. Saigo, H. Sakamoto, Y. Hosono, Y. Yamashita). Composition and Sintering Process Effects on Ferroelectric Fatigue in (1-x)Pb(Mg1/3Nb2/3)O3-x PbTiO3 Ceramics (M.H. Lente, A.L. Zanin, I.A. Santos, D. Garcia, and J.A. Eiras). Sintering Behavior of Additive Free (Pure) Lead Metaniobate Ceramics (N. Marandian Hagh, M. Allahverdi, and A. Safari). Electroceramic Fibers for Active Control (Marina Pascucci, Pavel Bystricky, H.B. Strock). Influence of Hot Pressing Parameters in Microstructure Evolution of PBN on Morphotropic Phase Boundary (Vera Lúcia Arantes, J.A. Eiras and Ivair A. Santos). Synthesis of High Strain Piezoelectric Crystals and Textured Ceramics. Feasibility of the Growth of Relaxor-Based Ferroelectric Single Crystals (Haosu Luo, Haiqing Xu, Bijun Fang and Zhiwen Yin). Two Inches Size Single Crystal Growth of Piezoelectric Pb[(Zn1/3Nb2/3)0.91Ti0.09]O3 by the Solution Bridgman Method (Mitsuyoshi Matsushita, Yoshihito Tachi, and Kazuhiko Echizenya). Improved Dielectric and Piezoelectric Properties of Pb(Mg1/3Nb2/3)O3-32.5PbTiO3 Ceramics and  Textured PMN-PT (A.R. James, S. Kwon, E. Sabolsky, G.L. Messing and S.T. McKinstry). Solid-State Single Crystal Growth of BaTiO3 and PMN-PT (Tae-Moo Heo, Jong-Bong Lee, Dong-Ho Kim, Ho-Yong Lee, Nong-Moon Hwang, Jong-Keuk Park, Ui-Jin Chung, and Doh-Yeon Kim). Laser Heated Pedestal Growth of Lead Magnesium Niobate, Lead Titanate Crystals and Their Characterization (Jianyi Cui, Ruyan Guo and Amar S. Bhalla). Effect of Li2O and PbO Addition on Abnormal Grain and Single Crystal Growth in the Pb(Mg1/3Nb2/3)O-35MOL% PbTiO3 System (John Fisher, M.-S. Kim, S.-J. Kang, and H.-Y. Lee). High Aspect Ratio Platelet SrTiO3 for Templated Grain Growth of PMN-PT Ceramics (M.E. Ebrahimi, M. Allahverdi and A. Safari). Synthesis of PMN and 65PMN-35PT Ceramics and Films by a New Suspension Method (Hongyu Luo, Wan Y. Shih, Wei-Heng Shih Dielectric Materials Development and Device Fabrications). Microwave Properties of Low-Temperature Co-Fired Ceramic Systems (Richard G. Geyer, Liang Chai, Aziz Shaikh, and Vern Stygar). Near−Zero f Doped-Niobate Ceramics for Dielectric Resonator Applications (R.C. Pullar, A.K. Axelsson, and N. McN. Alford). Low-T Sintering, Low-Dielectric Materials for High Frequency Ceramic Multilayer Parts (Linghong Luo, HePing Zhou, and KeXin Chen). Low-Inductance Barium Strontium Titanate Thin Film Capacitors for Decoupling Applications (Koichi Niwa, T. Shioga, J.D. Baniecki, and K. Kurihara). Dielectric Properties of (Sr1-xPbx)TiO3 (x=0.2, 0.25, and 0.3): MgO Composites (Y. Somiya, A.S. Bhalla, and L.E. Cross). Lattice Misfit as a Design Parameter for Enhanced Dielectric Response and Tunability in Expitaxial Barium Strontium Titanate Films (Z.-G. Ban and S.P. Alpay). Synthesis and Microwave Characterization of (BaO,SrO)-Al2O3-2SiO2 Ceramics from the Solid-State Reaction Process (Y.P. Fu, C.H. Lin, and C.C. Chang). Dielectric Relaxation of Nb2O5(0.92): SiO2(0.08) Ceramics (H. Choosuwan, R. Guo, A.S. Bhalla, and U. Balachandran). Effects of Glass-Frit Addition on the Mechanical Strength and Reliability of Non-reducible Y5V MLCC (J.H. Hwang, C.H. Lee, S.U. Ma, H.S. Shin, W.B. Park, S.K. Wi, J.H. Kim, Y.H. Han). Dielectric Properties of Modified Na0.5Bi0.5TiO3 Ceramics Materials (J.-P. Mercurio, Pascal Marchet, Senda Saïd, Jean-Richard Gomah-Pettry, and Jan Suchanicz). Fabrication of Grain Oriented Barium Titanate (T. Sugawara, M. Shimizu, T. Kimura, K. Takatori, and T. Tani). Low-Temperature Deposition of Bi4Ti3O12 -Based Ferroelectric Thin Films Using Site Engineering Concept (H. Funakubo, T. Sakai, T. Watanabe, T. Kojima, Y. Noguchi, M. Miyayama, and M. Osada). Chemical Approach to Ferroelectric Thin Films of Novel Bi-Based Layer-Structured Perovskite (Kazumi Kato, Kazuyuki Suzuki, Desheng Fu, Kaori Nishizawa, and Takeshi Miki). Effects of Added Boric Oxide on the Dispersion of Aqueous Barium Titanate Suspensions (C.-C. Li and J.-H. Jean). Effect of Re-Oxidation Treatment on the Tc in Rare-Earth and Acceptor (Mg,Mn) Doped BaTiO3 (Hiroshi Kishi, Noriyuki Kohzu, Hitoshi Ohsato and Takashi Okuda). Temperature Dependence of Dielectric Properties of Rare-Earth Elements Doped BaTiO3 (Eunsang Na, Yunsung Jung, Sungchurl Choi, and Ungyu Paik). Dielectric Properties of Barium Titanate Sintered with ZnO-WO3 Flux (Deep Prakash, B. P. Sharma, P. Gopalan and T.R. Rama Mohan). Effect of Processing Conditions on the Core-Shell Structure and Electrical Properties of Strontium Titanate Doped with Yttrium Oxide (Stephen J. Lombardo, Rajesh V. Shende, and Daniel S. Krueger). The Effect of Microstructure on the Electrical Properties of PZT Thin Films (C.R. Foschini, B.D. Stojanovic, J.A. Varela, and J.F. Fernández). Pb(Zr.52Ti.48)O3 Thin Films on Metal Foils by RF Magnetron Sputtering (Suk-Hun Choi, W. Y. Shih, J.W. Yi, Y.H. Lee and Wei-Heng Shih). Materials and Design Issues for Piezoelectric Materials. Designing with Piezoelectric Actuators (Kenji Uchino). Piezoceramic Bimorph Flexure Beam Displacements and Rotations (Arthur Ballato). Materials and Design Issues for Cryogenic-Use Multilayers (Steven Pilgrim). Ferroelectric Characteristics and Phase Transitions Studied by Thermal Strain and Optical Methods (Ruyan Guo).